Yin and Yang can be used to create harmony with who you are. 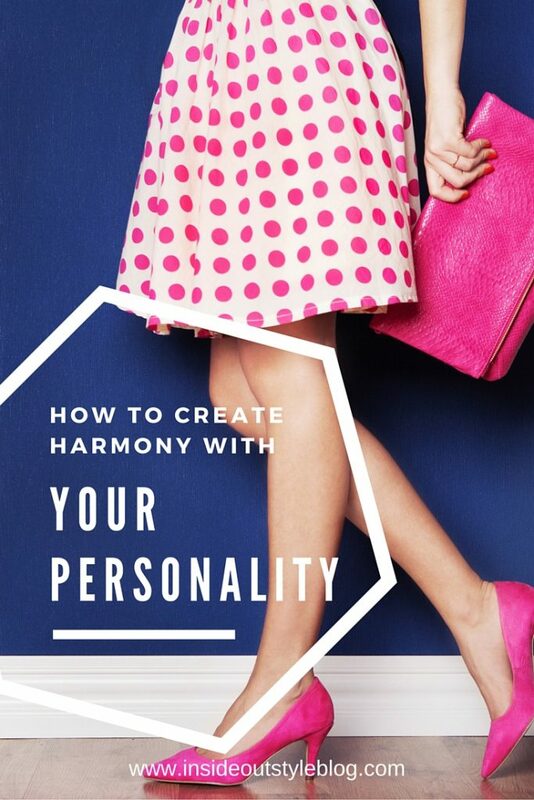 Personality is such a huge factor in the clothes we choose, what we like and dislike. It’s important to work with your natural personality to appear authentic. Which is appears more authentic on her? From everything I’ve ever seen of her, interviews and the like, it’s the Yang that sits more comfortably on her skin. The Yin (Prada) rose dress and matching shoes seems at odds with what I understand of her personality. She wanted to look much more Yin (approachable) when she wore the dress (for the launch of her English Roses children’s book), but it feels false and too try hard. With a more naturally Yang personality (Dramatic, Rebellious), Madonna suits a more Yang appearance. Though sometimes she likes to balance her natural yang with some yin elements such as these pictures above. 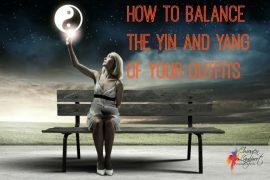 Understanding how Yin and Yang elements communicate can help you express your personality through your clothing and accessories. 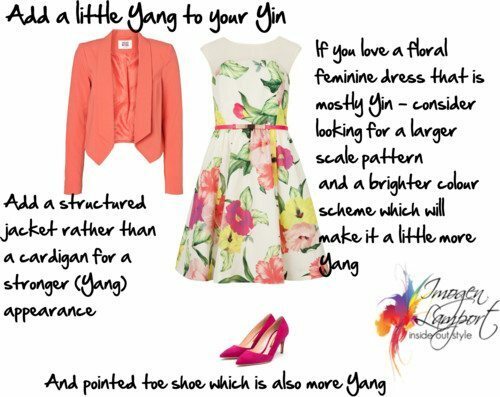 You can use yang elements to give yourself the appearance of strength, assertiveness or boldness. You can use yin elements to create an appearance of approachability, warmth and softness. Remember it’s easy to balance your personality, if you find that people find you rather intense or a bit cold, add some yin elements to your outfit. If you are seen as a pushover, if people find you a little to easy to walk-over, it’s time to add some yang elements to what you wear. 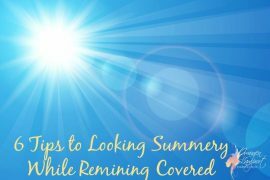 It’s so easy to play with these concepts to change your outfit a little at a time to find the right balance for you and what you want to communicate. Lol it seems like there will always something that condricts (sp?) with something else regarding our clothes! 😛 and Its something Im experienced myself. “a theif pretending to be a cop” is a comment I often get from it. Im not the least “romantic” so people accuse me for being insecure when layer camis under sheer or low cut clothing or wearing short skirts with opaque tights + tall boots (for occasions where its appropriate, but not on daily basics. LoL) just because I dont wear them the “typical” way. :/ I just happen to love those looks, even if they dont “suit” my personality! I find this a bit a bit stereotyped and notice alot of ppl focus on what you are wearing, not *why* you are wearing them. Interesting however, im seems to be a blend between this concept, the element traits were more yin, my apperance is in the middle (average tall, medium contrast, neither angulare or very curvy etc) and my personality is a combination of both yin/yan. Thank you Lina. It’s interesting to compare the different outfits of Madonna. But I don’t like the therm “yin and yang”. What would you call them instead Maggie? I am not anglophone but maybe it would be possible to find some occidental terms. How do you feel about :strong/soft or masculine/feminine ? There may be other ways you can describe these concepts. Thank you Imogen. I like strong/soft to describe this. Maybe you’d like to take David Kibbe’s lead and go across the spectrum from dramatic (most yang) to natural to classic to romantic (yin). I find the concepts of yang and yin simpler and to the point. I really must look up this David Kibbe and understand about his types! His book, written in the ’80s, is still very relevant. 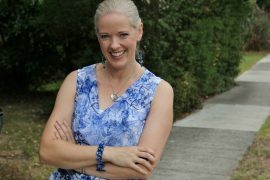 Thanks Tara – yes from corporate to massage you’d have to go way more Yin – and not just for the comfort factor – but balance is often the best for most of us, rather than too extreme one way or the other. 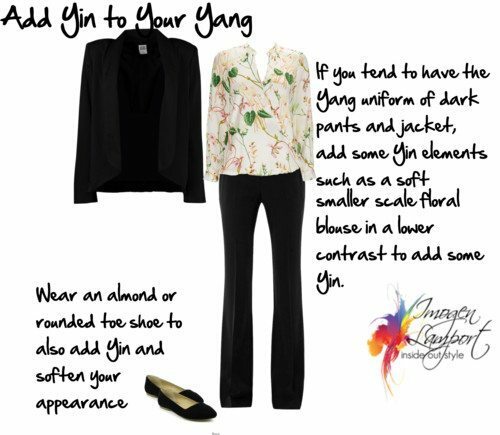 This is an interesting post, I am definately a combination of yin and yang, much prefer a jacket over a cardigan, especially at work. I just read through above again, I am a yang person with yin thrown in. I love these posts on yin and yang. I would have never thought of this. 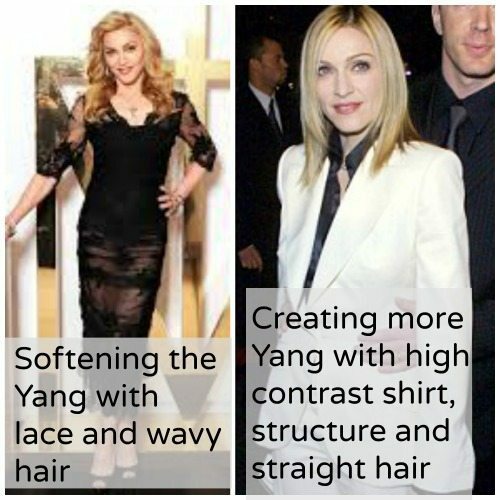 I am a very yang looking person, (tall, angular and large features) and tend to go towards yang styles. However the most interesting part is that people may (and do) see me as as a bit cold/intense at first, even tho I’m not when you get to know me! I am going to try this and see if I get a a different reaction. I feel silly in really girly things tho, I’ll have to start slowly. Thank you for this, Imogen! It so interesting that you are putting into words what it is that I try to balance in my work wear. I am an accounting consultant, hired by large companies to “fix” problems that they are experiencing in their operations. I have to appear competent and in control, but approachable, warm and empathetic. I try to balance the professional “yang” side of my looks with different “yin” characteristics. I wear very tailored clothes to convey professionalism and because I am physically large (5’10” size 14 US) but I soften them up using lower contrast color combinations and softer more feminine (but still proportional) accessories. In response to Liz above, I don’t wear florals or overtly “girly” things – I just soften up lines and color combinations without sacrificing the tailored look. 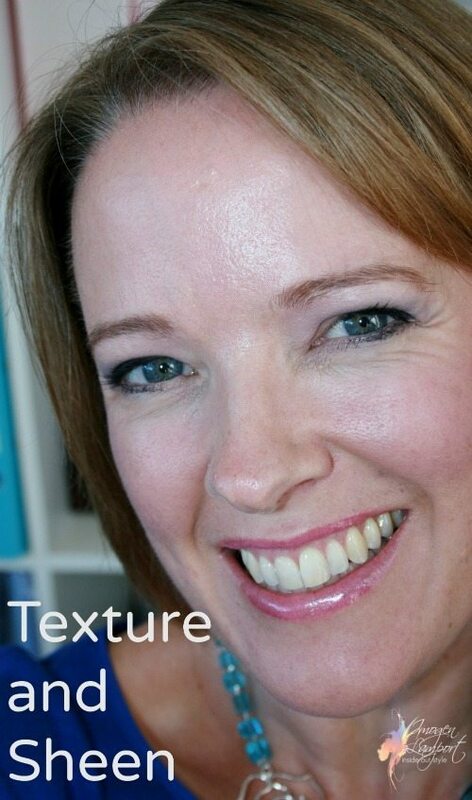 I think it does match my authentic self – I think of myself as a right-brained person living in a left-brained world – thank you Imogen! I think I discovered very early in life that my natural build was in conflict with my personality. I am a pretty “soft” person all round – soft with animals, children, old people you name it, too kind for my own good, very sensitive, very caring, creative by nature and by career choice. Unfortunately I looked quite different and people read me as “hard”. Tall – 5′ 9″, heavy jawline, long narrow fingers and feet (though not heavy or wide bones) high contrast – very dark (if very wavy) hair and pale skin. I always looked less approachable than I felt and wished I had been shorter and rounder. Well rounder came with age! Actually, I always had hips and a small waist, even when very thin, but am now more of a tall, elongated hourglass. Still, I find that the floaty fabrics, shapeless forms and anything delicate including small jewellery, don’t suit me, I need more structure and a definate waistline to look good. When I wear these things though, I often feel corporate and stiff, which I’m not. I tend to live in jeans – dark indigo, slim legs not skinny, three quarter sleeve fitted T’s and tops and a trench coat and or fitted little cardigan. Personality wise I would go towards a more boho style, but this just doesn’t look right on me. The dresses that suit me are fitted and curvy with a definate waist – but I feel too vampish and self conscious in them, like I should be touting for business in the local bar!I have tried fitted and knitted as more casual, but again these feel just a tad too boring, like my perennial jeans and trench combo. I might try that combo you suggest though Imogen, the larger flowers and more colour on fitted dress to soften it. I have read other comments from readers regarding this mismatch between personality and body/build and yes, it is a bit of a problem, second only to the colour thing! But hey, all we can do is just keep on trying! Imogen, I have a question for you. You say that rounded shoes are more yin (I agree) and pointed shoes are more yang (also agree). What about shoes with more squared toes? Where do those fall?